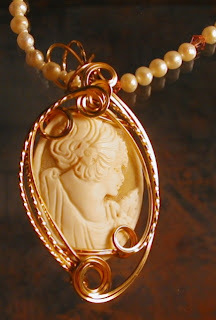 Cameo's are small intricate sculptures that are meant to be worn as jewelry. A genuine cameo is a carving in relief done on a naturally occurring substance such as conch shell or agate which contains different colored layers. Carving a cameo requires cutting away the upper layers of the shell or stone surrounding an object such as a face or figure so that the picture stands out in stark relief against the darker lower layers. Our student quality cameos come from the Italian town of Torre del Greco, where virtually all of the worlds seashell cameos are carved by hand. The cameo carver serves a 6 to 10 year apprenticeship before he is considered a master of his craft. Using sterling silver and 14K gold filled wire, we wrap our cameos intricately in a sculptured wire setting that shows off their delicate beauty.